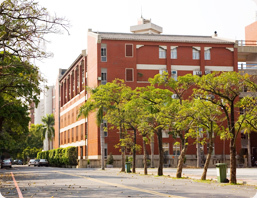 Our campus is located on the Jia-nan Plain, in the southwest part of Taiwan. As the most important agricultural area of Taiwan, the Jia-nan Plain can be called “Taiwan’s home of rice and seafood." Set against mountains and facing the sea, the plain has beautiful natural beauty and scenery. Within this area, many medium- and small-scale businesses have been developing and booming. Today, with the establishment of The Tainan Science-Based Industrial Park and Industry Research Institute, the entire Greater Tainan region has changed from a traditional agricultural area to an important base of industry and advanced technology. This development certainly offers a promising future for our students' studies and careers.Campus scenes. STUST is located in a suburb of northeastern Tainan City, which covers an area of 16.29 hectares. To the west of the campus is Tainan City, and to the east, Yung Kang City. It is less than 4 kilometers from our school to the Tainan Railroad Station. The Main North-south Highway and Central Highway intersect near the school, and we are also very close to the major National Freeway. Our school is indeed located in an area with the beauty of the countryside and the convenience of metropolitan life. During holidays, students and faculty can go to the beaches of An-ping and Chi-ku, where they can fish or take a stroll under the moonlight. People who enjoy mountains can go to local scenic areas such as Zengwen Reservoir, Wushantou Reservoir, Jianshanpi Reservoir, Guanzihling Hot Spring, Tsou-Ma-Lai Farm and Hsinhua Forest. All are within easy reach of our campus. Since its establishment, STU has had long-term plans to develop further. Thus the budget has increased every year and construction projects have finished progressively on schedule. The school now contains 31 buildings, including the Auditorium, Teaching and Research Building, Internship Workshop, Library, Student Union Building, and dormitories for male and female students. In addition to these facilities, there are well-built facilities for sports, including tennis courts with nighttime lighting. In addition, since the establishment of the school in 1969, a great number of trees and plants have been planted on the campus. The soothing green lawn, foliage, and shade beautifully contrast with STUST's red brick buildings. The campus featues many unique gardens and ponds such as the Garden of Welcoming the Rising Sun, the Garden of Kissing the Clouds, the Garden of Exalted Virtues, the Garden of the Banyan Tree, the Coconut Woods, the Pond of Making Wishes, the Pond of Dancing Cranes, and the Booth of the Magic Mushroom. 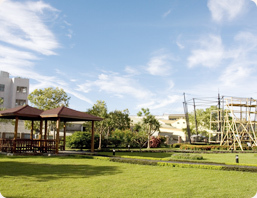 With different seasonal flowers blossoming, the landscape of the campus, designed according to different land altitudes, has provided students and faculty with an excellent place to rest and study. Our university is founded by a private organization and has a strong ambition to become a prestigious school. Today, with its goal of holistic education, the school is continuing its immense efforts to promote the position of vocational education and to cultivate competent people for the development of our industrial and business society.